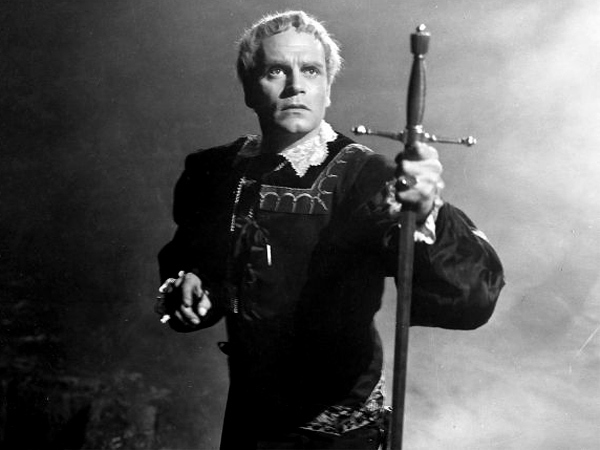 Today, I'm commemorating the 400th anniversary of William Shakespeare's death a bit early (it's April 23) with a look at Laurence Olivier's film noir-inspired take on the bard's great tragedy, Hamlet. 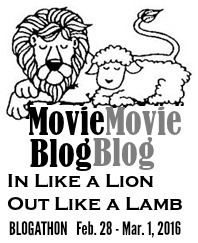 This article is part of the In Like a Lion, Out Like a Lamb Blogathon hosted by MovieMovieBlogBlog, which is all about movies classic film bloggers didn't think they would like but actually ended up enjoying. William Shakespeare is England's greatest playwright, and his rich body of works are still enjoyed by audiences all over the world. However, at least for me, Shakespeare can be a bit of a dicey proposition onscreen. Sometimes movies of Shakespeare's plays are good (Kenneth Branagh's Henry V), sometimes they're bad (the Leslie Howard-Norma Shearer Romeo and Juliet), and sometimes they're just plain boring (if you can keep your eyelids open during any of the BBC's eighties Shakespeare adaptations, then you're doing better than me). Actor and director Laurence Olivier was one of Shakespeare's great onscreen interpreters, and, while I have always enjoyed his film version of Richard III (1955), I was a bit reluctant to take on his 1948 version of Hamlet, mostly because I think Shakespeare is still best played onstage where the audience's reactions become part of the storytelling (the best example of the magic of a live performance captured on DVD is recent Oscar winner Mark Rylance's stage version of Twelfth Night). The plot: Hamlet is Shakespeare's longest play. The running time for Branagh's screen version of Hamlet, which includes the entire text of the play, is 4 hours and 20 minutes. Olivier knew that wouldn't work for forties audiences, so he extensively cut the play, removing about half the dialogue. While Olivier leaves in most of the famous soliloquoys -- To Be or Not to Be, To Thine Own Self Be True -- he drastically cut a lot of the speeches, which gives the play a modern feel. Instead of actors in doublets and hose declaiming long speeches, the characters interact with one another in clipped dialogue, which is especially effective in the ghost scenes and in Hamlet's interactions with Ophelia (Jean Simmons). The cinematography: To be honest, Olivier's performance as Hamlet isn't the best I've seen -- he's too old at 40, and he sometimes resorts to hammy overacting -- but he makes up for it with brilliant direction. Olivier and cinematographer Desmond Dickinson used deep focus cinematography to make the play come alive onscreen. The camera roves around every corridor and crevice in Elsinore Palace, which mimics the dark turn of mind of the Danish prince. The play scene (clip below), where the camera continuously rotates 360 degrees around the actors and the audience, is one of the best moments in forties cinema. Hamlet: The prince of Denmark is the ultimate noir anti-hero. He's obsessed with the past (even Mitchum never hanged his gallows quite as high as Hamlet), he's brooding (Hamlet's famous line, "How weary, stale, flat, and unprofitable seem to me all the uses of this world" could have been Bogart's motto), and his relationship status is definitely set on it's complicated (that tends to happen when you're torn between your mother and the emotionally fragile daughter of your stepfather's best friend). The Queen: No noir would be complete without a femme fatale, and Hamlet has that in spades. Herlie, who at age 29 was 11 years younger than Olivier, is so seductive that it's easy to see why her brother-in-law (Basil Sydney) would commit murder to win her hand in marriage. The queen is actually more sympathetic and less creepy in the original play, but Olivier's drastic text slashing meant the relationship between Hamlet and his mother is played out with Freudian overtones. 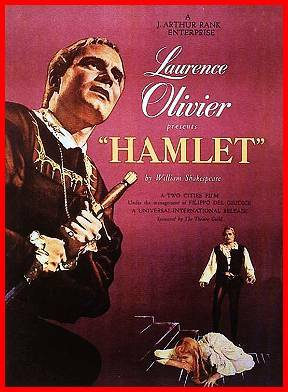 Hamlet was quite successful in its original run, winning four Oscars including best picture, best director, and best actor for Olivier. I'll leave you with a little touch of Larry in the To Be or Not to Be scene. Hamlet is available on DVD, Blu-ray and video on demand. Nice summation, esp. the (apparently apt) comparisons to film noir! BTW, if you're looking for filmed Shakespeare you can trust, I highly recommend Kenneth Branagh's 1993 version of MUCH ADO ABOUT NOTHING, which I'd go so far as to say is one of my favorite film comedies. In any case, thanks for contributing to the blogathon! Thanks for the recommendation. I've passed that one up on the library shelves many times, so I'll have to check it out.